The TMJ and intercuspal masticatory articulations are a continuum of the entire body posture articulation. Anatomic and/or physiologic changes at any postural level require compensatory neuromuscular accommodation. Clinical evidence has consistently shown the occlusal signs and muscular symptoms that occur over time when teeth are not able to take their optimal physiologic place (position) within the oral cavity. Various musculoskeletal problems will occur. 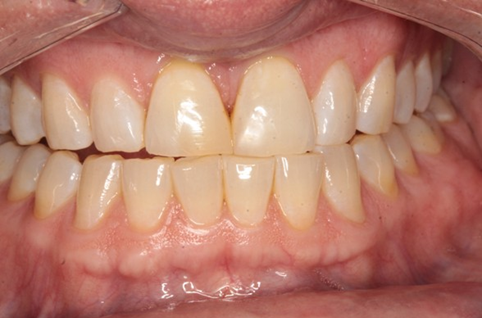 A 58 year old female above presents with numerous musculoskeletal occlusal signs and symptoms. 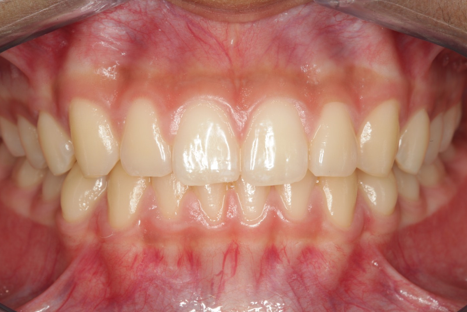 Because of the severity of her complaint a lower removable orthotic was implemented and adjusted following strict GNM micro occlusal protocols to get her comfortable and happy. 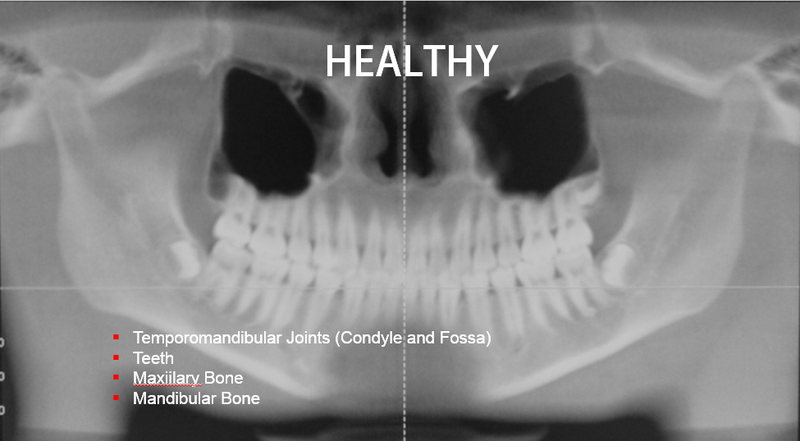 Every TMD patient is a walking example of the ill effects of the mal alignment of the postural system beginning with vertically under developed (or under erupted) molars and bicuspids. this contributes to narrowing of dental arches, insufficient room for the tongue and further results in a downward cascading effect of jaw collapse, abnormal head posturing, and degeneration on the temporomandibular joints (due to abnormal forces (lack of sufficient vertical occlusal support). 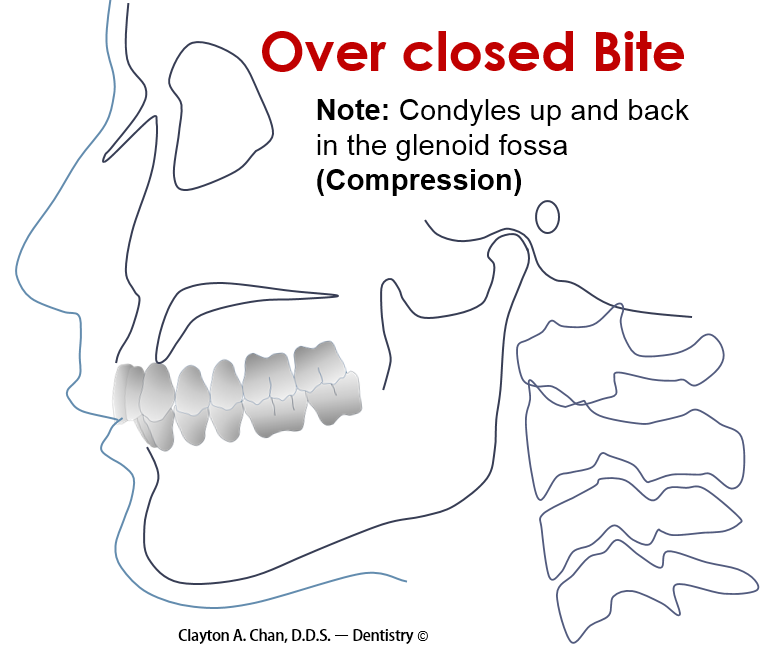 Because of these compressing forces the mandible retrudes while the masticatory muscles strain and skew the underlying bony structures of the cranium, mandibular condyles, cervical neck bones and downward. 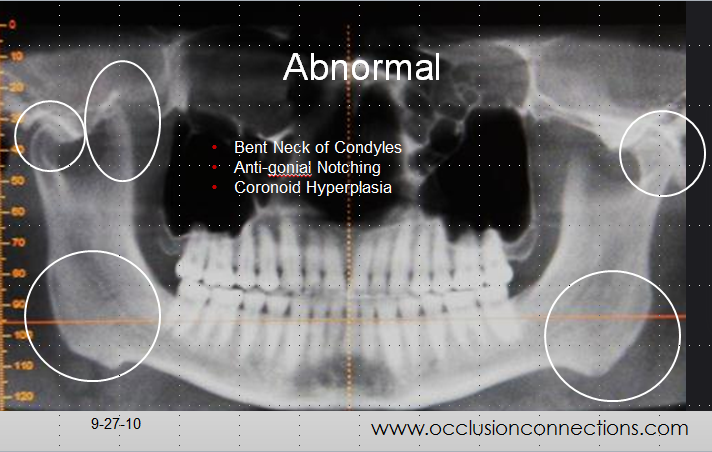 If condyles are bent at the neck and there is antigonial notching (bony outgrowth) at the lower posterior corners of the mandible/ramus, what muscle(s) do all think is over working and causing these bones to remodeling and grow abnormal bone in places that typically are not like that in “normal” healthy cases? Are the vertical tooth dimensions properly supporting normal healthy muscle function and resting modes? or are the muscles foreshortened and overworking? What do you think? There are many folks who are walking around with these abnormal conditions…. this is a sample of clinical evidence, which I know many dentist have observed on routine radiographic evaluation but may not have correlate it with the musculoskeletal signs and symptoms of underlying potential for TMD problems. Note: No gonial angle notching, nor extra boney growth exists with this 18 year old male. Normal vertical dimension of teeth supporting healthy musculature with no muscle tenderness or TMD symptoms. Normal mandibular range of motion is exhibited with no clicking or popping joints. Compression of anatomic structures is a generic medical model of patho-physiology, pain and dysfunction. 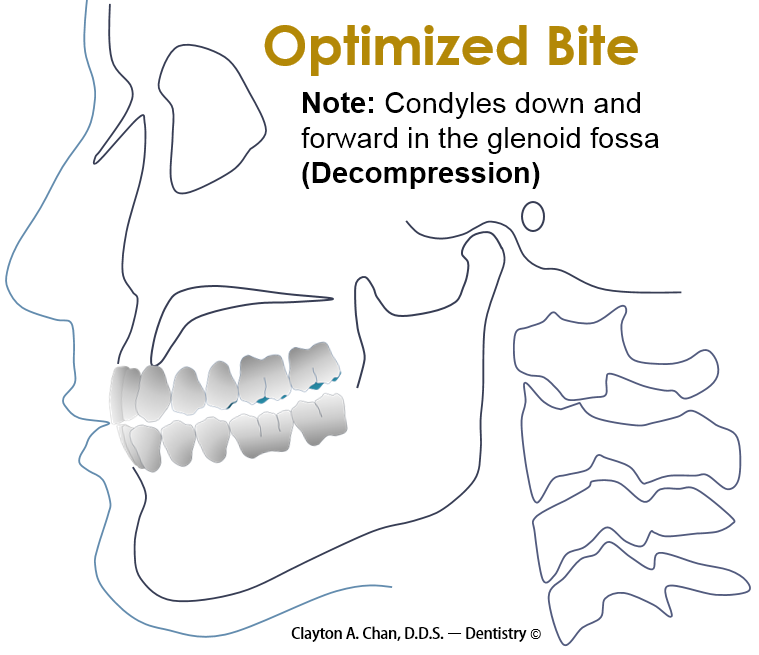 Mandibular mal-position and occlusal dysfunction can initiate or contribute to temporomandibular disorders (TMD). TMD is a multi etiologic musculoskeletal dysfunction having common pathologic characteristic of all musculoskeletal disease. Clinical dysfunction and symptoms occur when the need for structural and physiologic accommodation exceeds the ability of the organ system to accommodate. Decompression of impinged anatomic structures is the medical therapeutic model. General laws of homeostasis support the desirability of analysis of maxillo-mandibular posture from optimal muscle relaxation. Relaxation is good in the postural state. Muscle tension is bad in the postural state. Good laws of homeostasis and entropy support physiologic closure along an isotonic path of closure to terminal intercuspation. Relaxation of masticatory muscles prior to diagnosis and therapeutic procedures is a fundamental neuromuscular paradigm. The medical and dental literature supports lowering EMG postural activities as objective data of improved muscle relaxation state which is a universal therapeutic medical objective. Increased isometric force in the intercuspal position as a desirable objective is consistent with all generic physiologic and medical models of kinesthesia. Posterior vertical deficiencies arise from early childhood where first molars (six year) becomes blocked by abnormal tonque swallowing patterns. Lateral tongue thrust patterns can block upward growth movements of developing posterior teeth causing an eventual stunting of the lower 1/3 of the facial growth. Deep mentalis crease develops with underlying retrognathic facial profiles and chins. Mandible retrudes when there is insufficient posterior molar and bicuspid vertical growth and development which is key to allowing sufficient intra oral tongue volume and functional swallowing space. Dentists should recognize these early childhood and teen signs because if untreated it will lead to adult forms of TMD: masticatory muscle strains and pains, condylar and disc problems and temporomandibullar joint pains. Strained muscles and muscular imbalances not become the dominating problem contributing to teeth mal alignments and TM Joint problems. Have your dentist find your physiologic mandibular jaw position if you are experiencing musculoskeletal signs and symptoms and regain what was lost. It is never to late!